On Friday the 22nd of April 2016 we did publish a review for a retrospective, a compilation of the oldest stuff by Peter Andersson’s most known project, Raison d’Être. Around the period of that release, Old Europa Café also came up with the expanded re-release edition of Metamorphyses, one of the many Raison d’Être-albums that were on Swedish, and sadly defunct Industrial-label Cold Meat Industry (in 2006, FYI). 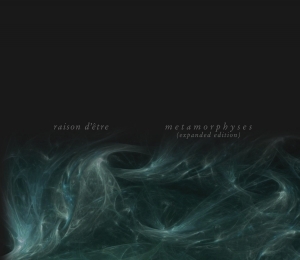 The digital edition is available via Peter’s own label Yantra Atmospheres.This Old Europa Café edition contains that seventh album under the Raison d’Être banner, and quite some bonus material, being unreleased studio registrations and live material (that hasn’t been released either the official way). Everything has been remastered in 2014, and this double-CD comes with quite sober yet intriguing artwork provided by Kati Astræir.“Transformation is the key to the psyche. It unlocks the hidden domains inside us and finds the paths to inner wisdom. ’Metamorphyses’ is a journey into the deep inner self; a drama of the sublime and transcendental transformation of the psyche through a katabasis ritual presented in six transitional stages slowly moving towards completion. ’Metamorphyses’ is the key to the psyche.”Raison d’Être always maintained a specific sound, even in the earliest years, though at the same time about every recording had that something distinctive, specific, differing from the other ones. That surely goes for Metamorphyses too. The album surely delves into untrodden dimensions, once again courtesy of a mastermind’s experience and vision. Metamorphyses is like a collage of long-stretched drones, quite ritual and meditative, profoundly droning and explicit mesmerizing. With Requiem For Abandoned Souls, Raison d’Être did delve into aural areas that weren’t that common, and that expedition continues, entering otherworldly, and why not, Arctic-Lovecraftian dimensions. This effort relies on continuously transformant sound structures, focusing on nihilistic introversion rather than experimental extravagance (cf. the early years; see the compilation’s review mentioned above to find out the huge difference). But for sure the minimalistic droning aspects, sometimes quite harsh in execution, then again obviously introspective when being more ambiently-attituded, are the main characteristics of this (sublime) album. Heavier pieces, like the fourth act, come close to the dimensions of Noise / Death Industrial / Power Electronics (the subtle way!). It’s quite evident to notice that, once again, Peter did not eschew to follow new directions, new anti-trends, in order to create hypnotic drone-fields. Metamorphyses was, and still is, a monument when talking about this specific sub-genre.Disc 1 also includes two previously unreleased studio excerpts. Both sketches come from the very same recording sessions, and therefor there is a huge resemblance. But then again, and that’s why I like this re-edition so much, these uncut pieces are quite mind-blowing. I mean that they remind of the final efforts on the album, yet with those distinctive elements in execution and sound… For sure every ‘fan’ (I detest this description) will adore these supplementary additions!Disc 2 comes with live material from gigs done in 2006, 2007 and 2008 in cities like Ghent (Belgium), Salzburg (Austria), Alkmaar (the Netherlands), Sofia (Bulgaria) and Budapest (Hungary). I am not always sure about releasing live stuff from this specific scene. One needs to experience it, at that time, at that place, losing reality in a sonic trip, transcending mortal life, trespassing physical existence. But sometimes the recorded result, being registered on master tape for eternity, might please even the ones who did not have the opportunity to experience the live ritual. I guess that in this case this moniker counts. Peter’s live performances are known as memorable, and this time the recorded results might agree. Damn yeah, the sound quality of these recordings is just sublime, but that isn’t necessary a conceptuation of the execution – but right here, it is. Primal droning non-depth experiences might irritate after a while, but that has not been the case right here (‘non-depth’ is not appropriate, by the way, so excuse me if I did confuse you). Personally, but that isn’t but an own, totally subjective interpretation, I am totally crazy about The Invisible Gate Of The Temple, which reminds me quite a lot to Raison d’Être’s historic Prospectus I album.